Can US Patriotic Missile Protect Poland? Japan's soldier stands near Patriot missile at a US Air Force base outskirts of Tokyo in 2017. Photo: Reuters/Issei Kato. US Updates Patriot Missile Defense System in S Korea Amid North Korean Threats. The Patriot missile system seems to have failed to do its job in Saudi Arabia. Instead of knocking out seven Houthi-fired ballistic missiles, reports from many sources cast doubt on the assessment made by Saudi government authorities. There is evidence shows that at least one missile not only missed its target but shortly after launch veered hard right and with its nose pointed down crashed into a Riyadh neighbourhood, killing at least one person. But the errant missile is not the main concern. There is no missile system that is 100% reliable. Sometimes a technical glitch or mechanical malfunction leads to failure. In the case of the errant Saudi missile, it looks like either the rocket motor performed improperly, pushing the missile off to the right and downward, or the guidance gyro failed. We have seen other rockets, even really big ones like the Long March from China, crash immediately after launch. A spectacular crash in a town adjacent to the launch site occurred on July 2, 2017, when a Long March 5 from the Wenchang Spacecraft Launch Site crashed shortly after launch. Updated and modified Scud missiles. Back in 1996, another Long March 3B smacked into a town near its launch site at the Xichang Satellite Launch Center in Sichuan killing a number of people and destroying property. Again in January 2018, another Long March 3B crashed shortly after takeoff at Xichang. Updated and modified Scud missiles In the case of the Long March, with controversial US help from Space Systems Loral and Hughes Electronics Corporation, China determined that the main gyro of the rocket failed because of a bad solder joint. The controversy stemmed from alleged violations of US export controls and the fact that the Long March is the same rocket used for China’s ICBMs. The Patriot is an evolved missile system, constantly updated to take account of new threats. But the rockets fired by the Houthis, which came from Iran where they were built following designs from North Korea, are an updated Scud missile but with some notable modifications and improvements. The two most important were removing the rocket fins, which are big radar reflectors, and implementing a separating warhead, making the task of an air defence system far more difficult. The Houthi missile is called the Burkan H2 (“Volcano”) that is, in fact, an Iranian-made Qiam missile, a licensed design from North Korea based on the Hwasong-6. All of these are variants of the Russian SCUD-C. This class of SCUD has a range of about 750 kilometres, or 470 miles, and a 750 kilogram (1,650 pounds) high explosive fragmentation warhead. Last November a Houthi Burkhan-2 missile was aimed at the King Khalid International Airport about 35km north of Riyadh. The missile warhead exploded adjacent to the end of the airport runway. Experts think the missile came close to hitting its target consistent with the Burkan CEP (circular error of probability), which is about 500 meters. While no one was injured, the blast shook up people inside the airport terminal. While claims were made, even by President Donald Trump, that a Patriot missile destroyed the Houthi missile, that claim is dubious because the missile warhead fell within its prescribed target area. The latest news of attacks on Riyadh and two other locations and videos taken in Riyadh suggests that along with one missile failing and turning hard right and into the city, another missile clearly failed in flight. No one can now say for sure that any of the Patriots actually hit their targets. Patriot effectiveness has long been an issue. In the 1991 Gulf War, the analysis showed that at best 25% of the Patriots hit their target, but hitting a target does not always mean killing a target. In that same war, with Scuds fired at Israel by Saddam Hussein, the incoming rockets were hit, but not always destroyed. Sometimes they were knocked off course or tumbled toward the earth. Evaluations of the Patriot suggested the warhead needed to create a stronger explosion to knock out a ballistic missile. According to the Times of Israel: “The Patriot air defence system, during the winter of 1991, faced 39 al-Hussein Scud missiles, launched in 19 salvos. The commander of the Israel Air Force at the time, Maj. Gen. (ret) Avihu Ben-Nun, told former IAF pilot and military analyst Reuven Pedatzur after the war that, according to Pedatzur’s testimony before the US Congress, ‘only one al-Hussein warhead was evidently hit by Patriot missiles’.” But Patriot has “evolved” more toward a hit to kill solution, notably in the PAC-3 version, and away from a warhead blast spewing out metal fragments aimed at tearing up an incoming missile. It isn’t clear which version of the Patriot the Saudis fired in the most recent engagement, in three locations with a total of seven incoming missiles. The fact that one of the missiles in Riyadh exploded when it hit the ground suggests the missile was a PAC-2 version with an exploding warhead. 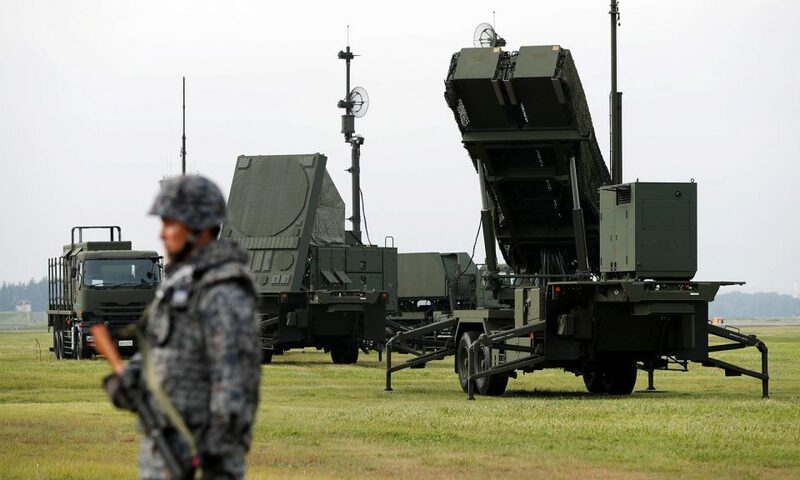 Whichever version – and the Patriot has some of the latest radar technology both on the ground and on board the missile – there seem to be two significant problems with it. The first is that the Patriot is fired when the incoming missile is in the terminal phase of its trajectory, so the Patriot is aiming to hit it only a few thousand feet above the ground and near its target. It would be better to destroy incoming missiles before they can release a separate and much smaller, warhead which may not show up on the radar. In addition, even simple decoys packaged with the warhead could confuse radar detection of the real warhead. It is unlikely the Burkan-2 has any decoys. PAC 3 is claimed to have a range of 35km, but as the videos of Saudi Patriot launches, and others like those in Israel demonstrate, the intercepts are far closer, at best only a few miles from the end-point target, and only at most a few thousand feet above the surface. Most would agree this is too close for comfort and puts at risk urban populations and high-value targets. Is it the case that despite the sophistication of the Patriot’s radars, it only picks up the missiles when they are very close to the targeted area? Or, alternatively, is the range highly overstated? Or is using the Patriot for point defence instead of area defence, not a good idea? The second problem is target discrimination. From the debris of the King Khalid Airport attack, which has been put on display at Joint Base Anacostia Bolling near Washington DC, what remains of the warhead is mostly twisted metal. But the main rocket body appears in two large chunks, both pieces mostly intact. There is no evidence that even the main body was hit by Patriot shrapnel if struck by a PAC-2 missile, but maybe it was sliced in half by a PAC-3 missile. But just as easily the missile could have cracked in half when it hit the earth after a free fall. If the PAC-3 “worked,” then it hit the main rocket but failed to hit the separated warhead. This means that the discrimination capability of the Patriot – whichever version – needs improvement if it can be improved. None of the Patriot results, at least so far, can be said to be encouraging, despite the fact that the Patriot remains the backbone tactical ballistic missile and air defence system for the United States and for many allies in Europe, the Middle East and in Asia – South Korea, Japan and Taiwan. Perhaps it is time for a serious review of the Patriot to see whether it makes sense even in its evolved form, or whether a new system is needed. In the past, the Pentagon has backed the Patriot even while sponsoring improvements that, at least so far, don’t seem adequate. And while Raytheon, the Patriot prime contractor, has been immensely successful in marketing the system abroad, the company may see its market shrivel unless the Patriot performs better. Unless a truly objective review is done, and with it recommendations proposed and implemented, more and more countries will look elsewhere for solutions. Saudi Arabia has already indicated it has signed an MOU to buy the Russian S-400, as has Turkey. South Korea is developing the M-SAM Cheolmae-2 system in an unusual deal. The air defence system’s prime contractor is the Samsung Group partnered with French electronics firm Thales. But the M-SAM technology is coming in part from the Almaz Joint Stock company in Russia, based on S-400 technology including its X-band radar and missile guidance systems. Others strongly interested in the S-400 are India, Egypt, Iraq and Qatar. Missile defences are part of a package of defence assets that help bind friendly countries to the United States. If American defence systems are not up to the job, will countries trust America in future or look elsewhere? Will Russia grab the market and the influence that comes with it?